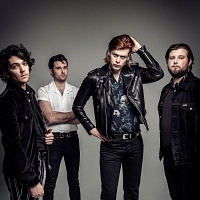 The Amazons are a rock four-piece from Reading,formed in 2014. The band features: Matty, Chrissy, Elliot and Joe. They released their debut album, "The Amazons" in 2017, plus 2019's: "Future Dust". They were nominated in the "best new band" categories of the Q and MTV awards in 2016 and also in the BBC's Sound of 2017 poll.